Kyirisan: Been There, Eaten That. Want More. There are restaurants where I dine once, enjoy the meal, and then happily check the box. I’ve been there, eaten that. 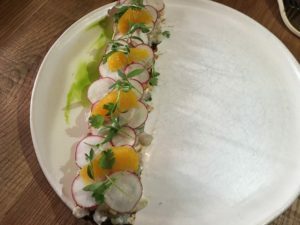 Others capture my attention and leap to mind when I respond to the frequently asked question: “What restaurants do you like these days?” My newest response is Kyirisan in DC’s growing food mecca, Shaw. 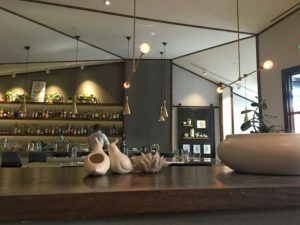 Kyirisan is the creation of Chef Tim Ma and his wife Joey. Ma is already familiar to many in the DC area for his Northern Virginia restaurants including Maple Ave (which he no longer owns), Water and Wall, and his relatively new sandwich shop, Chase the Submarine. Kyirisan is his first DC restaurant. Creating and sustaining a standout in the increasingly crowded Shaw has to be a challenge. Ma makes it happen with an innovative French-Chinese menu, a reflection of both his Chinese heritage and his training in French cuisine. Kyirisan is a hybrid of modern and casual. 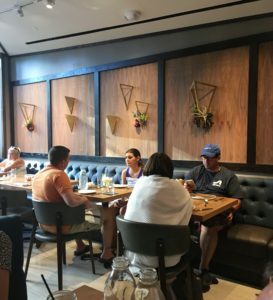 The decor features an elegant color palette of blue, taupe, and gray, with triangular shapes bringing something fresh to the table in restaurant design. We’ve come early in the evening, which gives us the chance to fully appreciate the light and airy design. We’re informed that dishes are meant to be shared. The menu divides into sections labelled “in the ground” for vegetables, “under the water” for fish, and “on the ground” for meat. We ask for insight about ingredients like tomato concasse, kalamansi baste infuse, hoisin sprite, and natto. This gives our genial server an opportunity to extol the virtues of the food, and helps us narrow the field. My three pescetarian companions and I settle on eight shareable vegetable and seafood dishes. Some plates are delightfully deceptive. 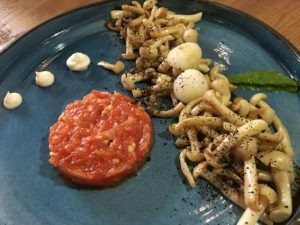 Foraged mushrooms with basil puree and chevre mousse appears to be accompanied by steak tartare, which in reality is a patty of juicy diced tomatoes. 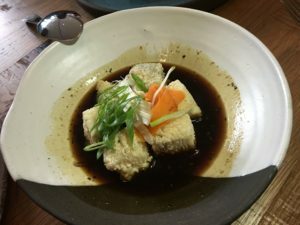 White pillows of fried tofu swim in a bath of black pepper sauce, surprising with its depth of flavor. 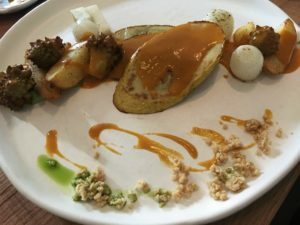 Japanese eggplant with red curry, apple slices, romanesco, potato, peanuts, and pea puree is terrific, but nearly impossible to split into four portions. Are dishes with so many components on the plate truly designed for sharing? 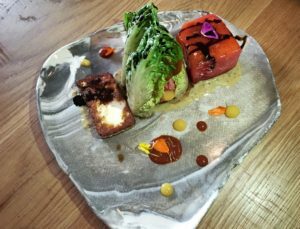 Korean flavors come into play when smoked watermelon is paired with ssam salad, gochujang chili paste, and pine nut puree. This is a really fun one for summer. Fish dishes at Kyirisan are more generously portioned than vegetables, which eases the pain of splitting. Sea bass is bold and bright with slices of oranges interspersed with radish and held together with fish sauce aioli. 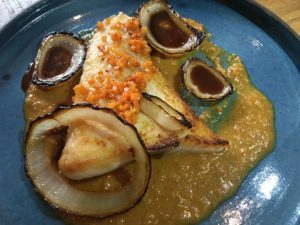 Halibut is adorned with charred onion rings and an exciting combination of sauces- peanut and hoisin sparked up with sprite. 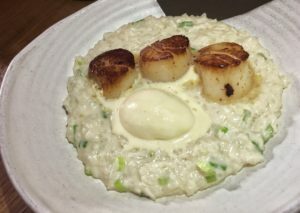 Chef Ma doesn’t need to rely on color to transform scallops with coconut risotto and basil ice cream into a richly dramatic dish. 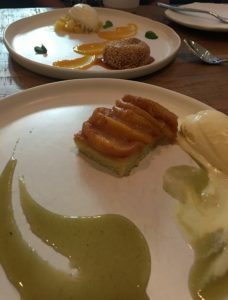 Desserts incorporate the same whimsical touches as the savories, with multiple components and swirls of sauces dancing on the plate. Tim Russell is the Beverage Director at Kyirisan. His concoctions are as well thought out as the food. Catch his light and refreshing summer drink menu while you can. I find dinner at Kyirisan to be unique and compelling. Been there, eaten that. Need to do it again soon.